Oct. 20, 2016, 11:18 a.m. The New York Times on Wednesday released a Facebook Messenger bot to cover the last 19 days of the U.S. presidential election. The bot combines automated updates with dispatches from political reporter Nicholas Confessore. Each morning, the bot sends users a message with its latest presidential election forecast (which may be a calming or unnerving way to start your day, depending on your political point of view). Users can also ask the bot for the Times’ projections for each state and a survey of recent national polls. 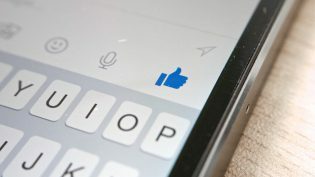 Some publishers, such as CNN and The Wall Street Journal, were quick to jump onto Messenger after Facebook introduced bots last spring, but others, including the Times, have taken a more wait-and-see approach to the platform and messaging in general. It’s unclear how many people actually want to use Messenger for news. In July, Facebook said more than 11,000 bots have been created for the platform, and many users have noted that there are often easier ways to find news or information. Still, the Times is heavily promoting the bot in its apps and on its website. Links to sign up for the bot are included in the paper’s coverage of last night’s presidential debate. The Times launched an earlier experiment with messaging in August when deputy sports editor Sam Manchester sent SMS updates about the Olympics from Rio. (A year earlier, the Times had experimented with WhatsApp.) At the time of the Rio project, product director Andrew Phelps, a former Nieman Lab staffer, told my colleague Ricardo Bilton that the effort was influenced by Purple, the political news texting service that moved to Facebook Messenger in July. 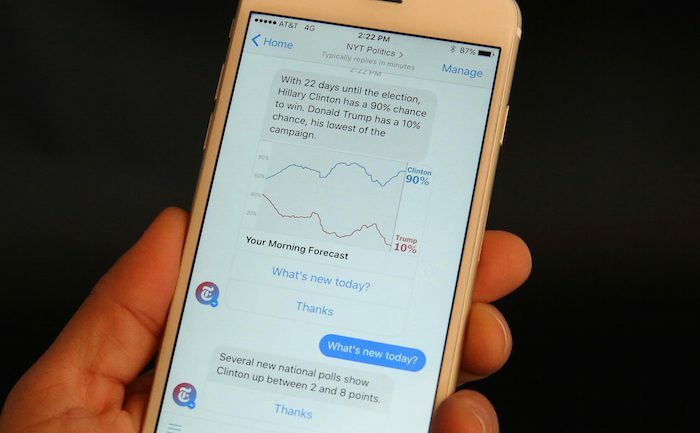 The politics Messenger bot seems like its trying to follow a similar approach by mixing the automated forecasts with Confessore’s more conversational updates. Marc Lavallee, then the Times’ editor of interactive news, said in August that messaging platforms could allow the paper to talk with many people at once in a way that feels intimate and personal. Lichterman, Joseph. "The New York Times is using a Facebook Messenger bot to send out election updates." Nieman Journalism Lab. Nieman Foundation for Journalism at Harvard, 20 Oct. 2016. Web. 18 Apr. 2019. Lichterman, Joseph. "The New York Times is using a Facebook Messenger bot to send out election updates." Nieman Journalism Lab. Last modified October 20, 2016. 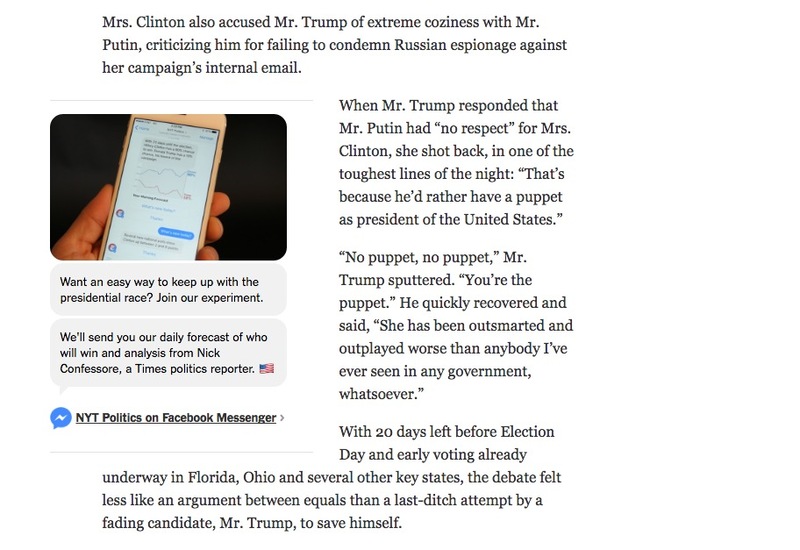 Accessed April 18, 2019. https://www.niemanlab.org/2016/10/the-new-york-times-is-using-a-facebook-messenger-bot-to-send-out-election-updates/.